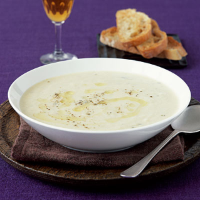 Cauliflower and Stilton are a great taste combination and this creamy, velvety vegetarian soup gets a hit of spice from the accompanying chilli toasts. In a large saucepan, heat the oil and gently cook the onion and garlic for 3-4 minutes until softened. Add the bay leaf and 1½ litres of cold water, then the potato and cauliflower. Bring to the boil then simmer gently for 15-20 minutes until the vegetables are just tender. Remove the bay leaf then purée the soup using a hand blender or a liquidiser until smooth. Pour back into the pan, add the crème fraîche and crumble in the Stilton. Heat through gently to melt the cheese then season generously with freshly ground black pepper. For the toasts, cut the ciabatta into thin slices and grill until golden and crusty. Halve the chilli and rub the bread all over with the flesh from the inside of it. Drizzle with a little oil and serve with the soup, also drizzled with a little oil. Chillies vary in heat intensity. Generally, the smaller the chilli the hotter the flesh. Wear rubber gloves when preparing chillies, or wash hands thoroughly afterwards.